In our first post of this three-part series on e-commerce in China, we investigated the rapidly developing online shopping market in China. In this post we want to take a closer look at who's dominating the Chinese e-commerce market. In the Chinese consumer-to-consumer market, the major players are Taobao, TOM Eachnet (formerly known as eBay Eachnet) and PaiPai. According to a study by the China Internet Research Center (iResearch in Chinese), Taobao held an impressive 83.8 percent marketshare in this sector in the first quarter of 2008, followed by PaiPai and TOM Eachnet with 9 and 7.2 percent respectively. At present all three websites are quite similar and only differ in some details, and all three portals provide their services free of charge. 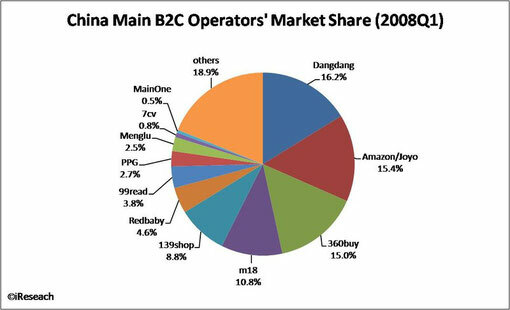 Taobao has a transaction volume of $6.23 billion in 2007. It's part of the Alibaba Group whose flagship product is the business-to-business trading portal alibaba.com. In October 2005, Alibaba Group and Yahoo Inc. formed a long-term strategic partnership. In the landmark transaction, Alibaba Group acquired Yahoo China and assumed control of Yahoo China's operations, and Yahoo invested $1 billion and became a strategic shareholder in Alibaba Group. Just five years ago, Taobao didn't hold quite such an overwhelming lead. Eachnet, founded in 1999, was China's number one auction site with a peak marketshare of more than 90 percent. The site's popularity attracted eBay's interest, and eBay bought the company in 2003. But the process of integrating Eachnet into the global eBay platform was characterized by enormous difficulties and took over a year, giving Alibaba the perfect window of opportunity to enter the consumer-to-consumer market with Taobao. In 2004, Taobao already occupied more than 50 percent of China's consumer-to-consumer market, while eBay stood at about 35 percent. EBay Eachnet invested heavily to strengthen its presence in China but continued to lose market share to Taobao. 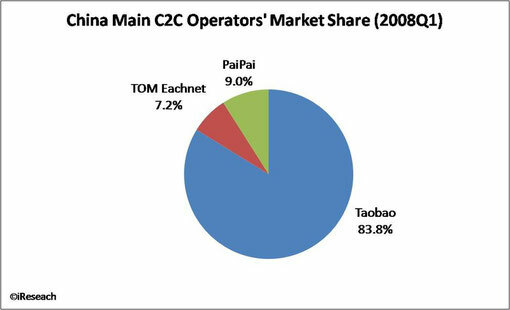 And in 2006 eBay sold 51 percent of Eachnet to Tom Online, a wireless internet company with services in China. EBay's listing fees were only one of the reasons why customers preferred Taobao. Many internet users also disliked eBay because of its service. EBay's PayPal did not offer an escrow product, however Alipay, which is Taobao's payment system, had this feature built in from the beginning. Even though eBay eventually incorporated escrow at a later stage, additional factors kept the majority of Chinese users from trading on eBay. One of these was that Taobao let its users communicate directly through instant messenger. Dangdang and Amazon (also known as Joyo in China) dominate the business-to-consumer market and occupy almost half of the market, with the rest of the market being served by many smaller e-commerce websites. At the end of 2004 Amazon acquired Joyo, one of the largest online retailers of books, music, videos and DVDs in the country at that time. It now (Q1 2008) holds a marketshare of 15.40 percent. The market leader and direct competitor is Dangdang with a market share of 16.20 percent. Before the market entry of Amazon, Dangdang was often referred to as "China's Amazon." 360buy emerged as another strong competitor and occupies 15 percent of the business-to-consumer market. The rest of the market is controlled by vertical business-to-consumer websites. Most vertical sites also operate offline. Suppliers of baby and young children's products, pet accessories, entertainment and household electronics have been especially successful. According to the latest CNNIC Survey Report on Online Shopping in China (DOC, in Chinese), China's online shoppers seem to be very loyal. 60 percent of the online shoppers only surf one web site when buying things, while only 33 percent surf two. With 67.3 percent of its users only shopping on its website, Taobao has the most loyal user base in China. Taobao has cultivated a large number of online shoppers in China. Many users experience online shopping first with Taobao and then shift their attention to other online shopping sites. Taobao, TOM Eachnet, Dangdang, Amazon and PaiPai are the five best known shopping websites among internet users in China.When online shoppers are asked which shopping website comes to their mind first 70 percent answer Taobao, 8.4 percent say Dangdang and 7.9 percent say TOM Eachnet. According to the CNNIC survey, 20 percent of online shoppers only know one shopping website. Among those 20 percent, 80 percent only know Taobao. Taobao is the leading portal in terms of brand awareness and brand conversion; however, regarding brand reliability Taobao only ranks third among the five major shopping websites. Nevertheless, it ranks higher than its competitors in the consumer-to-consumer market, namely PaiPai and TOM Eachnet. Taobao recently launched Taobao Mall with business-to-consumer stores that should cater to more demanding users. Dangdang enjoys higher brand awareness, but Joyo is superior in brand conversion and brand reliability. TOM Eachnet was among the first shopping websites in China and therefore enjoys 41.9 percent brand awareness among online shoppers, the second highest. However, due to the failure in recent years, the conversion rate (the percentage of shoppers who know the website and are actually making a purchase) is relatively low, reaching only 20.1 percent. Tom Online decided to completely rebuild the acquired Eachnet platform. And to catch up with market leader Taobao, Eachnet has stopped charging any fees since the beginning of May 2008. Taobao and PaiPai have been providing free services since they were founded. Taobao, by the way, announced that it will start charging its users after its first three years of operation - that means it will be a paid service beginning 2009. PaiPai, an online marketplace since 2006, has also announced that its service will be free for at least three years. Additionally, Chinese leading search engine Baidu.com announced in December 2007 that it will enter the Chinese e-commerce market by leveraging its high user traffic and large online communities. Details are still scant, as the service is only just launching, but China Web2.0 Review has a closer look. Whether any of these companies will eventually charge transaction fees or come up with a completely new, China-tailored business model remains to be seen. Ma Huateng, CEO of Tencent, parent company of PaiPai, believes that e-commerce in China is still far from being a mass business, and e-commerce companies will first have to popularize the market and educate users. Given these circumstances, one can assume that none of the consumer-to-consumer platforms are currently profitable. Tom Group's 2007 annual report, for example, reports a loss of $15.07 million (104 million Yuan) for Eachnet. Taobao can limit its losses by interest earned on the transaction volume on its escrow account, however no sustainable profits can be generated for far. Although eBay has sold its Chinese online market place, it has held onto its market place for cross-border transactions, which according to eBay/Paypal is profitable and developing well. Cross-border trade is a core competence of eBay and therefore the company enjoys a competitive advantage over Taobao and Paipai, which only serve the domestic Chinese market and do not allow international transactions.